If a popular comedian refers to your product as a “Pop-Tart with nasty meat,” is it possible you have a branding problem? The maker of Hot Pockets apparently thinks so. That’s why Nestlé (NESN.VX) is revamping its lineup of ready-made, microwaveable sandwiches to make them trendier, more authentic and less reminiscent of cafeteria food. 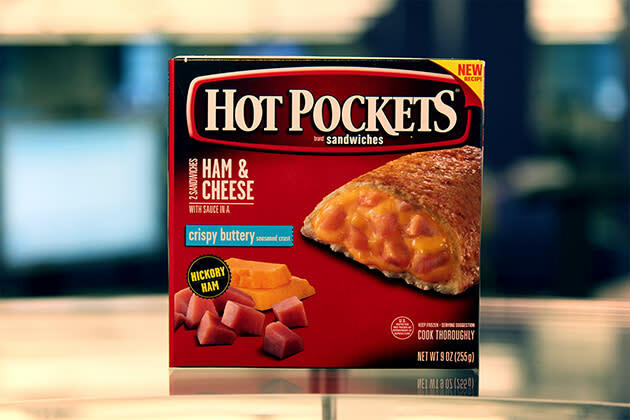 Nestlé says Hot Pockets, which typically sell for between $3 and $4, will now be made with premium ingredients such as Angus beef, hickory ham, white-meat chicken and “real cheese.” The company isn’t saying what kind of meat and cheese it’s been serving in Hot Pockets up till now, but the sandwiches date to 1983, which may have been the glory days for processed food. Back then, Mexican food was a U.S. novelty, Pac-Man and Donkey Kong were popular breakfast cereals and Diet Coke was brand new. Comedian Jim Gaffigan may be the most famous critic of Hot Pockets. In a well-known, four-minute riff, he bemoans the buyer’s remorse — and stomachaches — that typically accompany his choice of a Hot Pocket for dinner. “I’ve never eaten one and then [said], ‘I’m glad I ate that,” Gaffigan confesses. More than 2 million people have watched the clip on YouTube. In addition to shedding that regrettable reputation, Nestlé is obviously trying to capitalize on the craze for virtuous food that has made chains such as Chipotle (CMG) and Panera Bread (PNRA) highly profitable, and led fast-food stalwarts such as McDonald's (MCD) and KFC (YUM) to add salads, wraps and other healthier options to their menus. For Hot Pockets, the bar is pretty low: The website CalorieCounts.com gives most Hot Pocket varieties a grade of C or lower, with one (Flatbread Sausage Egg and Country-style Gravy) earning an F. Lean Pockets are a bit better, yet still packed with partially hydrogenated this and that and other staples from the food-chemical closet. 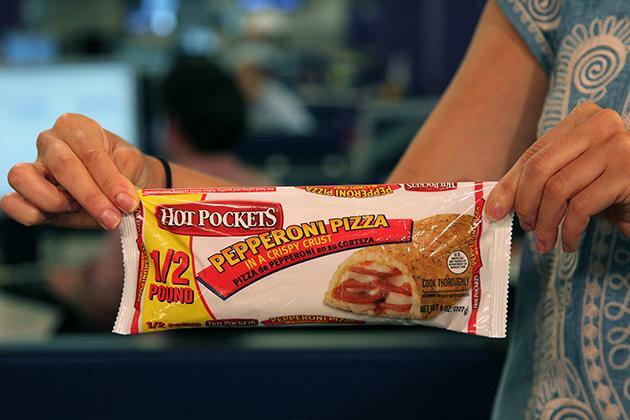 Hot Pocket fans don’t seem to mind the nutritional dings. Sales of the sandwiches are up 2.5% during the recent year, according to Advertising Age, which is better than average for frozen sandwiches. And even though healthy foods are buzzy, people still like the convenience of a hand-held meal that can be popped in the microwave, making Hot Pockets ideal for kids or workers on the go. At least one diner is impressed. “I’ve always enjoyed Hot Pockets sandwiches, but the new and improved varieties are incredibly good,” Jeff Mauro — the Food Network’s “Sandwich King” — gushed in a Nestlé press release. As a paid spokesperson, Mauro will work to counteract the negative impression Gaffigan has created. In one forthcoming ad, Mauro will show off the Nestlé kitchen where Hot Pockets are made, to persuade skeptical viewers there’s real food inside. Other ads will emphasize the ingredients more, as will the packaging. Anybody who has ever wondered what’s inside one of those things will now have a better idea.